This article was originally published by the Institute for War and Peace Reporting (IWPR). An ex-Bosniak politician from Prijedor testified this week about the 1992 takeover of power in the municipality by the Serbian Democratic Party, SDS. Mevludin Sejmenovic, a former chairman of the Bosniak Party of Democratic Action, SDA, in the Prijedor municipality, was giving evidence in the trial of former senior police officials Stojan Zupljanin and Mico Stanisic. Zupljanin, who became an adviser to the Bosnian Serb president and Hague indictee Radovan Karadzic in 1994, is accused of extermination, murder, persecution, and deportation of non-Serbs in northwestern Bosnia between April and December 1992. Stanisic is charged with the murder, torture and cruel treatment of non-Serb civilians, as well as for his failure to prevent or punish crimes committed by his subordinates. Stanisic and Zupljanin are alleged to have participated in a joint criminal enterprise aimed at the permanent removal of non-Serbs from the territory of an intended Serbian state. They are accused of crimes committed between April 1 and December 31, 1992, in 20 municipalities throughout Bosnia, including Prijedor. 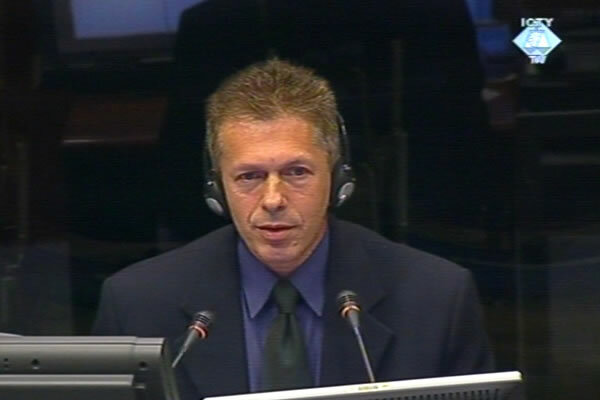 Sejmenovic was making his sixth appearance in The Hague and has testified in all trials involving indictees charged with crimes in the Prijedor municipality camps of Omarska, Keraterm and Trnopolje. At the beginning of this week’s statement, Sejmenovic said that in the spring of 1992 he and his fellow SDA members were prevented from returning to their workplaces in Prijedor municipality by the Serbian Democratic Party, SDS, aided by Bosnian Serb forces. “They prevented everyone from returning to their jobs [in public institutions], when people asked by telephone whether it was safe for them to return they would be told to stay at home, and the next day it happened in companies as well,” the witness said. “Non-Serb directors and managers in enterprises were not allowed to go to their jobs, and some days later, none of the non-Serb employees were allowed to come to work. “In all senior positions, non-Serbs were prevented from entering the factories, with Serbs having been installed in their places. Therefore, this prohibition didn’t actually only apply to SDA members, but to all non-Serb citizens in general,” the witness continued. Prosecutor Matthew Olmsted inquired about the fate of the SDA leadership after 1992. “Well, some three people from the leadership survived, whereas almost 90 per cent or 95 per cent of the municipal SDA leadership was killed,” the witness answered. Sejmenovic went on to describe how the non-Serb population was restricted from moving or travelling beyond the Prijedor municipality. The checkpoints, according to the witness, were held by the “police and reserve troops”. “Did you at that time hear of crimes being committed against non-Serbs at the checkpoints?” the prosecutor asked. “There was an incident at the checkpoint toward Omarska, a man had been beaten up and his vehicle was taken away,” Sejmenovic answered. He explained that civilians including women and children were prevented from leaving the town of Kozarac, adding that there had been an attempt to evacuate them toward Banja Luka but that they were returned. According to the indictment against Stanisic and Zupljanin, the attacks on the villages of Hambarine and Kozarac prove the coordinated actions by the Bosnian Serb military and police forces. The prosecution claims that at least 800 Muslim civilians were killed during those attacks, while the majority of arrested men were either killed or taken to the Omarska and Keraterm camps. “Did you ever seek explanation as to why they were prevented from leaving the municipality?” Olmsted asked. Sejmenovic also explained that, in Kozarac, non-Serb children were not allowed to go to school anymore, and “that after [the SDS] [took power], electricity and telephone networks worked for a few days and then, just before the attack, both were switched off”. He said that in April and early May 1992 – before the takeover - there were already artillery positions around Kozarac. Sejmenovic indicated these sites on a map shown to him by the prosecution. “Officially, they were set up by the Yugoslav army, although people from the 5th Kozara Brigade and those coming back from frontlines in Croatia could also be seen there,” he said, claiming that Kozarac came under artillery fire from Prijedor during this period. As the trial progressed, Sejmenovic went on to describe how the SDA leadership tried to meet their SDS counterparts even after they took over power. One of those meetings, held in Banja Luka between May 15 and 20, 1992, was also attended by the accused Zupljanin. The witness explained that the delegation, led by Becir Medunjanin, later killed in the Omarska camp, wished to explain that they “were not armed and had no bad intentions toward the Serb population and that they were ready and willing to together solve the situation”. The witness then described another meeting between the SDS and SDA, held in mid-May 1992 in Prijedor, which he also attended. “The SDA party wanted to meet the SDS leadership because we were completely blocked, the normal course of life was interrupted, people were scared, we had not planned any attack whatsoever. We therefore wanted to speak to the SDS and find solutions,” he continued. During that meeting, the SDS leadership gave them an “impossible ultimatum”, asking the SDA to give up 5,000 pieces of weaponry. “It was impossible, we had very little weapons, nothing of military use, maybe a few dozen guns, but there were many hunters in the area so there was quite an amount of hunting weapons, private pistols and [old] Turkish guns but still [not] more than 1,000 pieces in total,” the witness said. Sejmenovic said that the key problem was that “we knew that there wasn’t even a theoretical possibility because we didn’t have that amount of weapons, so we couldn't possibly meet those demands”. The witness recalled that the SDA held one more meeting with the SDS in Prijedor. “This delegation was executed, they never returned from the meeting,” he said, claiming they had intended to discuss how the weapons would be surrendered. “They simply never returned from the meeting” Sejmenovic repeated. The Institute for War and Peace Reporting has been providing unique and continuous reporting and analysis of the International Criminal Tribunal for the former Yugoslavia since 1995. With its International Justice – ICTY programme IWPR produces weekly reports, and recently launched a weekly radio program, Facing Justice, broadcast across the region.